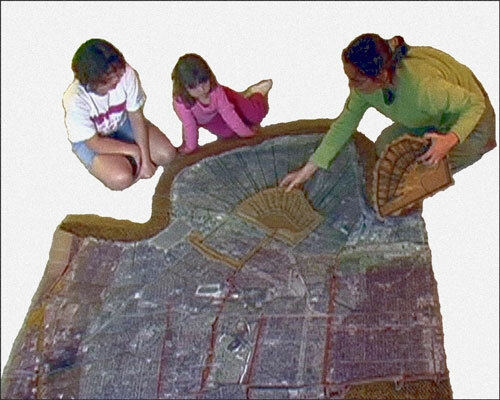 This graphic contains a still capture from video depicting an informal presentation and discussion of the interactive model to a small group of children and adults. The image expresses the interactive and educational components of model representation. Contains the first four pages of a proposed manual delving into the concept of Bayou as Infrastructure for the rebuilding of New Orleans. This representational form was later abandoned for the more effective representational form of interactive model. This graphic embodies the second representational form the project took; animation. 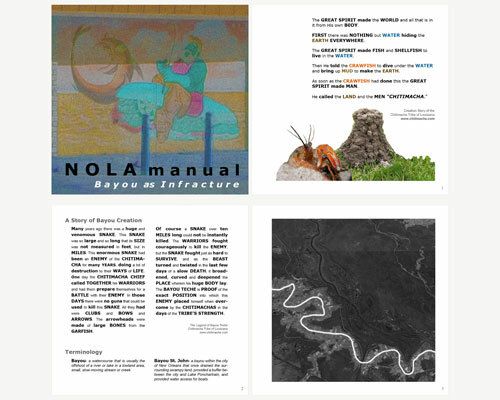 Bayou characters were created to formulate the argument for the concept of Bayou as Infrastructure in simple entertaining terms. Contains page 1 of the final form the project took; a video narrative in documentary style that includes a demonstration of the interactive model. The video narrative begins with an easily understood overview of the dynamic deltaic plain landscape. 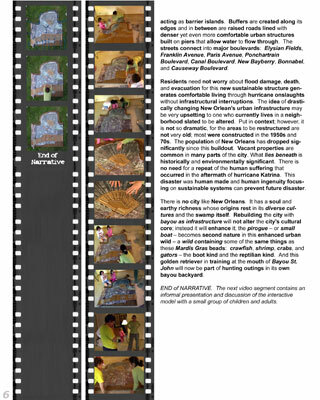 Contains page 2 of the video narrative that briefly orients the audience to the condition of post Katrina New Orleans with glimpses of a house gutting and the path of historic Bayou St. John; the core component of Bayou as Infrastructure. "Amazing in its use of simple materials and the tactile nature of the message delivery. Using a puzzle and storytelling as a way to inform and engage the general public is an effective and responsible example of how landscape architects should communicate about possible solutions." 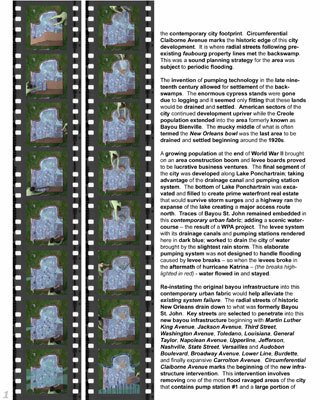 This semester long studio project focused on communicating the idea of Bayou as Infrastructure for the rebuilding of New Orleans. A variety of methods were utilized to communicate this concept to the general public. While formulating the concept I experimented with video animation and storytelling in conjunction with an educational manual. 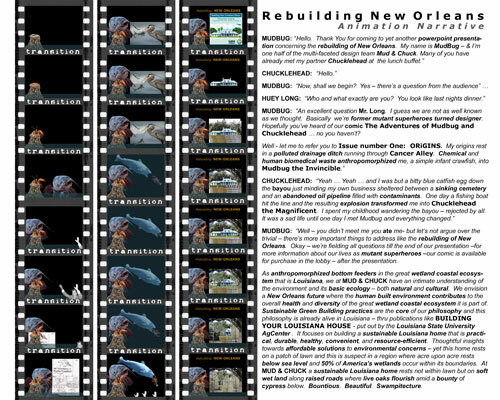 After sharing these mediums with a general audience; I transitioned these ideas into a video narrative and the creation of a representational interactive model of New Orleans. The interactive model proved to be a very effective communicative tool. Its working parts were equally efficient at generating productive conversation. The audience became participatory members in the process; feeling free to ask questions while the model was being assembled before them as well as volunteering to help create the model for it was in pieces; a complex puzzle to solve. The model itself was 6 feet long and depicted the landscape of New Orleans from pre-settlement to present day and onward to future sustainable design interventions. In many ways it was a performance piece; usually assembled on the floor with the audience gazing downward. Presenting from the floor generates a common ground where even the shiest individual feels comfortable enough to ask questions and make comments. Another benefit of this representational form is that in conversations following the model presentation; audience members actively disassembled and reassemble model pieces in order to further their understanding of the landscape of New Orleans. The intended purpose of all the communicative representational techniques involved was to relay the importance of the dynamic Mississippi Deltaic Plain landscape that New Orleans is part of. Public understanding of the systems at play in this landscape will aid in future reconstruction efforts and hopefully lead to sustainable development that respects these dynamic processes and utilizes them. Another key component of the representational process is to convey the beauty of the bayou or swamp landscape to the general public. Negative associations with the swamp still abound American culture. The swamp becomes a place of danger; disease, and putrid atmosphere with associations of unproductive land and savages. In direct contrast the swamp is a place of bounty and a sheltering paradise as experienced through the eyes of the cultures that dwell within. Louisiana often celebrates this swamp culture through cuisine, music, and fishing camps out in the bayou. Implementing these celebrations into the urban infrastructure of New Orlean's built environment is an important concept to convey. The interactive model is very useful in conveying these ideas. The greatest achievement of the interactive model lies in its ability to relate concepts of infrastructure and using bayou as infrastructure to control floodwaters, treat stormwater, create topsoil, and treat sewage. It enhances peoples understanding of these systems on an urban scale. By understanding all of the beneficial services these landscape interventions provide, it makes it much easier for a property owner to sell their piece of land and flood-ravaged home on the backswamp and invest in revised property generated through sustainable interventions. One is not losing a home to create a "park;" one is gaining a home in a bayouscape whose amenities reach way beyond formal ideas of park and open space. What I enjoyed most about these experimentations in communicative techniques was their popular culture appeal and the grandness in scale of these ideas. Landscape architects hold a skill set much more involved and evolved than other design professions. One must understand culture, the environment, and scientific principles along with spatial and artistic knowledge to reveal and transform landscapes. Frederick Law Olmsted was a master of this technique. It is important never to lose site of the infrastructural and artistic impact landscape architects can generate in the environment. To achieve this ideal; one must be a grand communicator, visionary, and employ the appropriate tools to relay these concepts to the public at large. Bayou as Infrastructure achieves these goals. 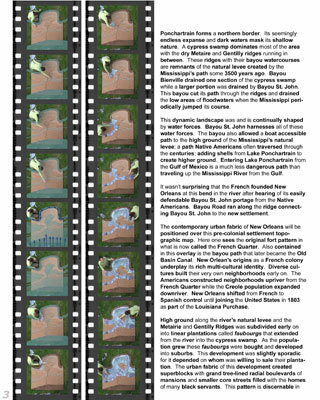 Contains page 3 of the video narrative that begins to overlay the contemporary city fabric in somewhat chronological order. This physical process makes the building of a city in relationship to its landscape easily understandable to a diverse audience. 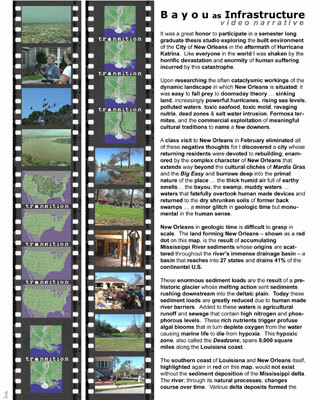 Contains page 4 of the video narrative that begins to depict specific design interventions of Bayou as Infrastructure. 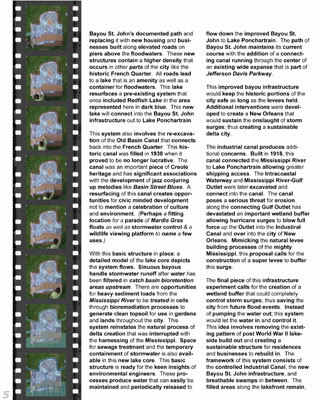 Contains page 5 of the video narrative that continues to depict specific design interventions of Bayou as Infrastructure. 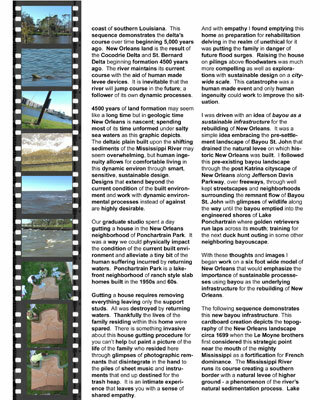 Contains page 6 of the video narrative that reemphasizes the importance of rebuilding the city of New Orleans with the Bayou as Infrastructure. The image also contains stills from an accompanying video segment that demonstrates the benefits of an interactive model with audience participation. American Society of Landscape Architects © Copyright 2006. All rights reserved.